How can the fiberglass statues be secured down? Each of our statues have a reinforced metal bracket in each hoof or base which enables you to secure your fiberglass statue to almost any suitable surface. 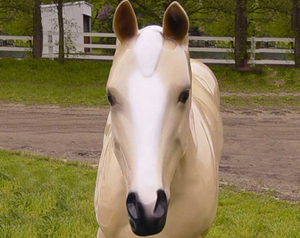 Can the fiberglass animal statues I purchase be painted to match my animal? We can custom paint our statues to order. All we need are pictures of the animal you want your fiberglass statue to be painted like. We also sell all our statues primed gray so you can paint it yourself, and we can also paint it one of our standard breed colors. You do not display the animal or statue that I am looking for; can you make me what I want? Yes! We do custom orders. We can modify one of our existing products or we can sculpt the statue model you are looking for. When modifying one of our existing products or making a new model, there will be extra charges involved. How do I order my Fiberglass statue? You can place your order online by email or by calling us at 763.477.6904. What you need to know when ordering is which statue you would like to purchase, if you want it painted, how you would like it painted, shipping and billing addresses, and which form of payment you will be using. How can I pay for my Fiberglass statue? If you are paying with a personal or company check, we require the full amount before your order is shipped out. If you are using a credit card (Visa or MasterCard), we will charge the full amount to your credit card before we ship your order out. All custom statue orders are half down and balance due upon shipping. How long does it take to receive my fiberglass statue? We recommend you allow about four to six weeks to ship out your order and about 2-5 business days for shipping. We will contact you when your oder ships out and if we have your item in stock, your order will be shipped out immediately. How are the fiberglass statues shipped? Our fiberglass statues can be shipped directly to your residential address or business location (please note what type of location). When we ship your order, we build a crate around your fiberglass statue so it stays protected unitl it arrives at your destination. The life-sized statues are all shipped by freight truck. For international orders overseas, all our shipments are quoted for pick up at the nearest airport or seaport terminal to your destination address and are crated in heat treated wooden crates. © FiberStock, Inc. All rights reserved.